ScottishPower — a subsidiary of Basque energy giant Iberdrola — said on Tuesday it will spend up to £2 billion in the UK in 2019, the company’s biggest ever investment in the UK in a single year. For the 2018-2022 period, ScottishPower said it will spend £6 billion in the UK — with 40% on new renewable energy generation, 42% on smarter enhanced networks and 15% on innovative services and products for customers. The announcements came as ScottishPower updated its investment plans following the sale of its thermal generation business and transition to 100% renewable energy in 2018. ScottishPower CEO Keith Anderson said: “Our first investment plan since leaving coal and gas behind is a historic milestone for ScottishPower and is a vote of confidence in the UK’s commitment to decarbonising the economy. “Consumers want and need access to reliable, clean and affordable energy. “That is what ScottishPower is focused on delivering and as long as Government climate change commitments stay firm, with sensible policies to support them, this investment will continue. ScottishPower said it will invest in smarter services for customers, including products to unlock the market for electric vehicle ownership. As part of its strategy for growth, ScottishPower announced plans for a new public electric charging service based within the company’s retail division. The new business will install fast chargers across the UK at strategic commercial locations from winter 2019. The company also announced plans for a 50MW battery storage project at Whitelee, the UK’s largest onshore windfarm located at Eaglesham Moor south of Glasgow. The large-scale battery project will be the first of a series of storage schemes, mainly located at windfarms and at strategic points on the network. In renewables, ScottishPower set out plans to develop a 1GW pipeline of onshore wind projects by 2025. “Onshore wind remains the lowest cost technology for new electricity generation in the UK and ScottishPower sees substantial opportunities for the continued development of onshore wind projects across Scotland and other areas of the UK,” added ScottishPower. 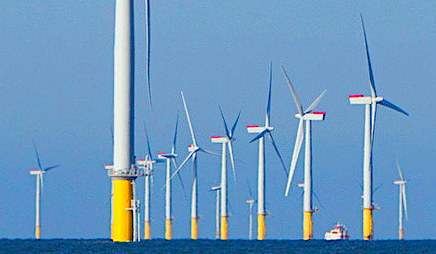 “Construction continues at pace for the East Anglia ONE offshore windfarm located 43km off the Suffolk coast. “The £2.5 billion project will see 102 Siemens Gamesa turbines deployed, each with a capacity of 7 megawatts; which could in total provide enough clean energy to power the equivalent of more than 630,000 homes annually. “Over 50 percent of the project’s total investment will be spent in the UK, ensuring the benefits of East Anglia ONE are felt across the country. “ScottishPower has also gained planning consent for East Anglia THREE windfarm for up to 1,200MW and planning consultations on the company’s next two large offshore windfarms in the East Anglia zone have begun. “If consents are granted, it is anticipated that East Anglia TWO will commence construction in 2024 and East Anglia ONE North will commence construction in 2025. “SP Energy Networks will continue to deliver smart and efficient grids capable of supporting the UK’s future energy needs. “In 2019 the networks business will focus investments on continuing the company’s leading role in connecting renewables in Scotland, Wales and England.